In his first press conference in Beijing, the new U.S. Ambassador to China Max Baucus said he has three goals: to strengthen economic ties with China, to be a partner with China to tackle common global challenges, and to do everything possible to promote stronger people-to-people ties. Beyond all doubt, these have been the most important jobs for all U.S. ambassadors to China during the past few decades. In particular, both Baucus and his predecessor, Gary Locke, highlighted strengthening economic ties with China as their top priority. This seems to be telling the world that these two leading economies might just find their way out of the potential doom awaiting two rival great powers. They seek to make this great escape through the type of grand and comprehensive approaches that have been talked up and stereotyped repeatedly, although such strategies are indeed very important. But there is a problem. Based on their respective strategic perceptions, it is obvious that there is no genuine mutual trust between China and the U.S. So, is there any mechanism for China and the U.S. to try to build a minimum level mutual trust at least on strategically important issues? There seems to be an important one. Five rounds of Sino-U.S. Strategic and Economic Dialogues have been held since 2009, but true Sino-U.S. mutual trust is still nowhere to see. 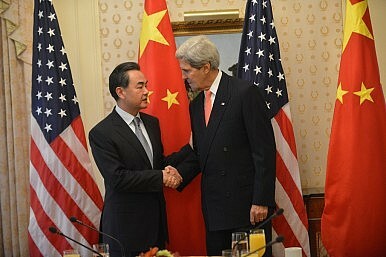 Rather, these two giants seem to be tangled with each other in a “Thucydidean trap” or a “prisoner’s dilemma.” Issues that could have made China and the U.S. join hands or at least might have helped them reach a mutual understanding instead turn out to be potential flashpoints or excuses for reciprocal accusations. One such issue is cybersecurity, which has heightened distrust between Chin and the U.S. in recent days after media reports said that the NSA “put considerable efforts into spying on Chinese politicians and firms.” Are these two giants ready to be entangled in a cyber-war? The consequences of a Sino-U.S. violent conflict are unacceptable and unbearable not only for China and the U.S., but also for the rest of the world. China-U.S. economic ties are already very close and these two economies can hardly find an easy way to depart from each other. However, on many regional and global issues, these two powers still hold very different views and positions. As a result, their partnership is simply no more than diplomatic rhetoric so far. People-to-people exchanges, one of Baucus’ goals, is a reasonable and profitable approach to enhancing mutual understanding and improving bilateral relations. Such exchanges may bring about far-reaching and profound changes to future China-U.S. relations. However, given the regional and world situation and especially the possibility of intensifying Sino-U.S. distrust, it’s better to get to the point and make changes happen quickly. The puzzle of closer economic ties accompanied by deeper distrust must be changed. On March 18, former U.S. Ambassador to China Jon Huntsman made a comment in Shanghai on China-U.S. relations in the context of the search for Flight MH370. He pointed out that both countries have the capability, but what is missing is coordination. To go a little further, the current China-U.S. relationship as a whole may be evaluated in the following three categories: capability, coordination, and political will. Both China and the U.S. have the capabilities to play their important roles in dealing with regional and global issues, and meanwhile both have the capabilities to present substantial threats to each other. However, coordination between China and the U.S.—the world’s two largest economies and two great powers with enormous military capacities—has lagged far behind expectations. Both have the capabilities, and thus there is a need for coordination, so why has it been so difficult to realize mutual reconciliation and strategic coordination between China and the U.S.? When we look back at history, the famous “ping-pong diplomacy” between Beijing and Washington reminds us not only of the strategically calculated alignment to confront a common threat, but also the strong and exploratory political will and bravery of political leaders on both sides of the Pacific. This political will is a necessary precursor to coordination. History gives us an example of ice-breaking between China and the U.S. There could and should be another one forthcoming. Dabbling in plausible rhetoric won’t buy any time for peace and reconciliation, and this is equally true for both Beijing and Washington. US-China Strategic and Economic Dialogue: Putting on a Brave FaceThe 2015 US-China Strategic and Economic Dialogue: What (and What Not) to ExpectOvercoming 'Abnormal Normality' in the US-China Relationship3 Takeaways from the 2014 US-China Strategic and Economic DialogueHas the Thucydidean Trap Already Sprung on China and the US?